President Obama is confident the Senate will pass its comprehensive health care bill before Christmas, he said in an interview taped for Sunday's edition of "60 Minutes" – adding that it will prove to be one of the most important pieces of legislation in decades. 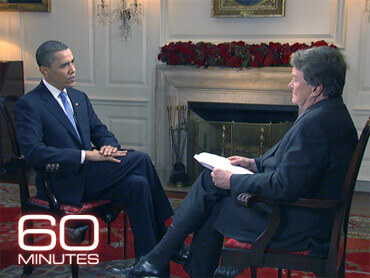 "I think it's going to pass out of the Senate before Christmas," Mr. Obama said in the interview. Health care reform has proven to be a daunting challenge in Washington for decades, but after a year of debate and deliberation, Mr. Obama said the Congress has shaped a bill that will keep health care costs under control for both Americans and the federal government. "I think that when we look back after I signed this bill, people are going to acknowledge that not only was this the most important piece of domestic legislation since at least social security, but it also tackled the biggest problem that we had in terms of our long-term fiscal well-being," the president said. "Seven Presidents have tried to reform a health care system that everyone acknowledges is broken," he continued. "Seven Presidents have failed up until this point. We are now that close to having a bill that does all the things that I said and most experts said needed to be done when we started this process." Mr. Obama pointed out that, according to the nonpartisan Congressional Budget Office, the Democrats' health care bill is expected to lower premiums and bring down the federal deficit. The bill is also expected to insure around 30 million people who currently do not have insurance and institute a number of insurance regulations, the president said. "Now, that's what I wanted," he said. "That is what health economists have recommended. And lo and behold, here it is. Not a government-run program. Not socialist medicine, but a thoughtful -- although admittedly complex -- set of reforms that are going to make health care work better, more cheaply for American consumers." There are some disputes as to how well the bill would meet the president's goals. A report from the branch of the Health and Human Services Department concluded the Senate bill could slightly raise national health expenditures. Furthermore, some health reform advocates are upset that Sen. Majority Leader Harry Reid has weakened the insurance regulations in his bill. While the Congress has made unprecedented progress on its comprehensive health care reform package so far, the Senate could still trip up and miss its Christmas deadline for passage. Sen. Joe Lieberman (I-Conn.), who caucuses with Democrats, said on CBS News' "Face the Nation" on Sunday that he "would have a hard time voting for" a bill that would allow people over the age of 54 to buy into Medicare. Democrats recently proposed the Medicare buy-in as a compromise to replace the proposal for a government-run health insurance option, or "public option." While some have criticized Mr. Obama for not taking a stronger stance on the public option or other specific reform proposals, the president said he has been involved in the debate the whole time. "Just because I'm not, you know, over at the Capitol Building doesn't mean I'm not involved," he said. "You know my job is not to draft legislation. My job is to set forward a vision, point people in the right direction. That's what we've done. And that's why we're gonna get a bill."